As some of you know, I am interested in many food related things, including great recipes, great restaurants, great food fundraising events, films about food, independent films about food, hunger issues, and basic human rights when it comes to food. There is a this really nice documentary, The Starfish Throwers, coming the Nashville Film Festival which showcases three global leaders doing great things to help end hunger/starvation one person at a time... and then it has grown to whole communities. There is a retired teacher in MN who has been serving his neighborhood for decades - 365 days per year. There is a top chef in India who dedicates his culinary skills to feed the "untouchables" breakfast, lunch and dinner every single day. There was is a young girl at the age of 9 who feed 275 people from her garden, and then she has grown more and more gardens feeding more and more people. When you watch this movie, you will love the three global leaders, and you will see the face of hunger/starvation with renewed compassion. I promise you, you will feel really good seeing these 3 hero's stories, and you will want to root for them. I am planning on going to the April 19th viewing. Come join me and get that warm, feel-good feeling like I will have while watching this film. For folks living elsewhere, check out The Starfish Thrower's website for upcoming screening dates. 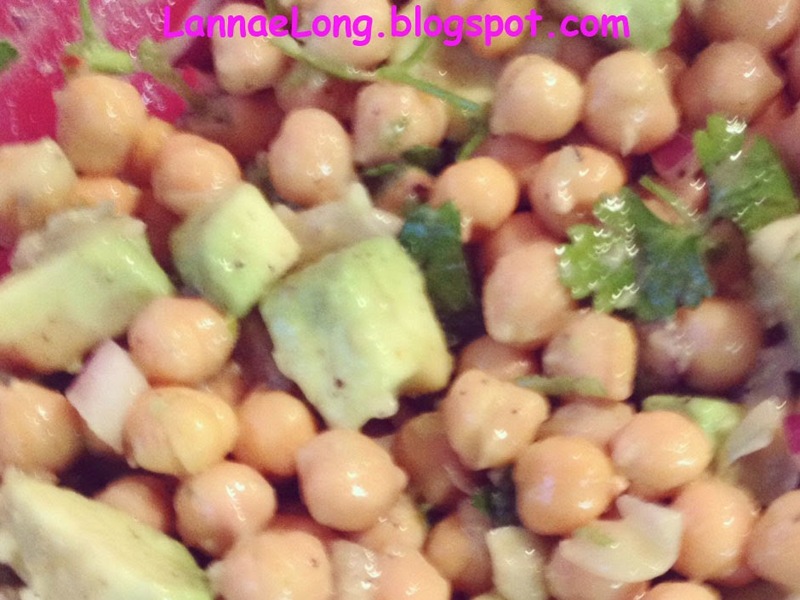 OK, here is a really yumm-o chickpea salad, and it is so easy. I can't stop eating it! The Omni Hotel in Nashville opened up last year, and it brought four food and beverage venues with it: Bob's Steak, Barlines, Bongo Java, and Kitchen Notes. Bongo Java is a locally owned coffee shop which is my favorite coffee shop in Nashville, and now Bongo Java has a bright nice and new location downtown. Bongo Java is owned by Bongo Bob, who strives to provide fair trade coffee, and good wholesome baked goods. Bongo Java delivers just a straight forward cup of coffee (I like just a basic large cup of coffee) as well as foam, no foam, soy, milk, almond, flavored, no flavor, espresso, drip, press coffee. The way you want your coffee in cup sizes you know (small, medium and large), Bongo will deliver. I hope the guests of the Omni Hotel enjoy this coffee as much as I do. I applaud the Omni for choosing a local fair trade coffee shop to represent their coffee option, rather than some generic ubiquitous green and white coffee option. 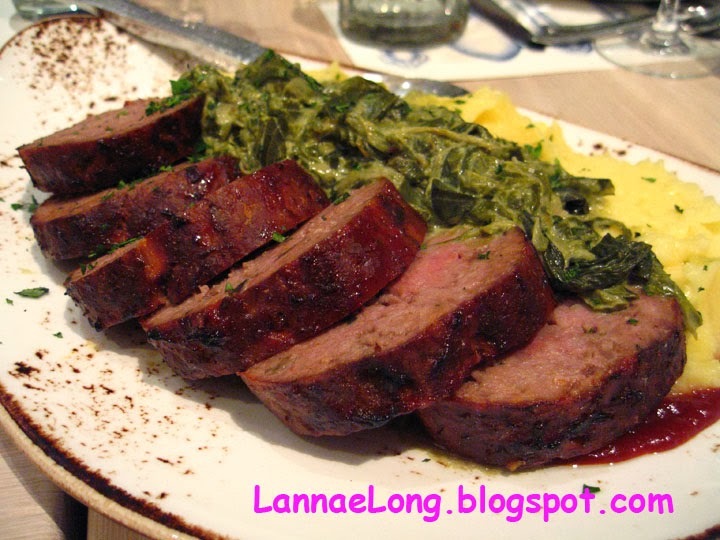 I was invited to a Nashville Food Bloggers party at Kitchen Notes last month. I was a little skeptical because some hotel restaurants are (woof woof), but I was pleasantly surprised about Kitchen Notes. The biscuits, service, main course and dessert was very tasty. I am always a bit wary of hotel restaurants, as many of them just stink because they cater to a captive audience (so they can still serve crap and people will have to buy it anyway or starve), but there is no reason to wary or leery of Kitchen Notes at the Omni Nashville. On this Nashville Food Bloggers party, we got to try all sorts of biscuits and jams to top them, bacon and bison meatloaf with mashed potatoes and creamy kale, and sour cherry tarts. Biscuits in Nashville are a tough business because there are a few places that are just SO GOOD at biscuits, and one might as well not compete unless one can bring it on. The Omni Nashville decided to "bring it". They have a biscuit bar in Kitchen Notes with all sorts of biscuits including plain, cherry, cheesy, jalapeno, maple bacon and more! I was able to have a plain and a jalapeno, and both were really good. 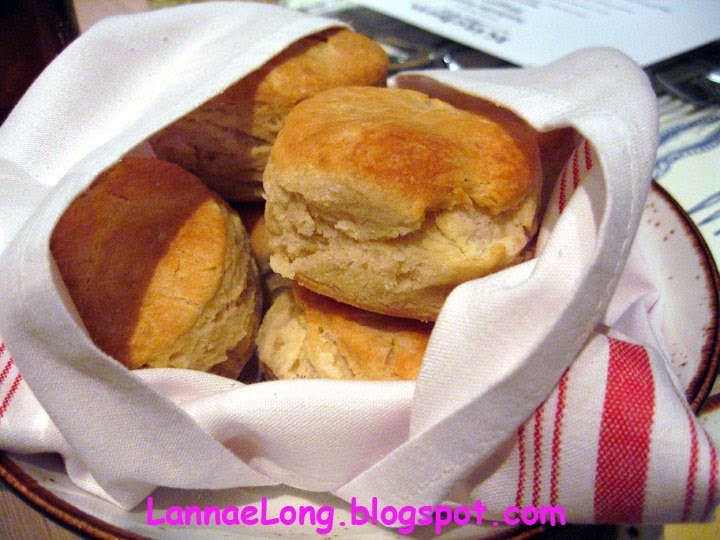 The biscuits were warm, fresh, fluffy on the inside, and just golden crispy on the outside. These biscuits are really good. The Nashville Food Bloggers universally enjoyed the biscuits at the party. The main course that I liked was the bison meatloaf with bacon in it. I am guessing the bison has less fat than beef or pork, so the chef had to add fat to it, so bacon and bacon fat it is. On this the bison meatloaf came with mashed potatoes and creamed kale. Kale is abundant here in Middle Tennessee all winter long. If the doctor says eat more leafy greens, and it winter, you bet your bottom dollar that you can get kale. Kale is a hearty winter green, and can be used in many ways, kale salad, kale saute, kale juice and creamed kale. 2 winters ago, trying to eat only local veggies through the winter, I probably ate pounds of kale every week. I am still burnt out by kale, but that did not stop me from enjoying the creamed kale at Kitchen Notes. I have never had creamed kale before, and never thought to do that. I learned something new, so next winter I may try my hand at creaming some kale. For dessert, we had a choice of mockingbird cake or sour cherry pie. As one who actually dislikes cake (I know, weird but true), I opted for the sour cherry pie. I loved it. I liked the top crispy lattice crust. I liked the sour cherry filling. I liked the crust and filling together. 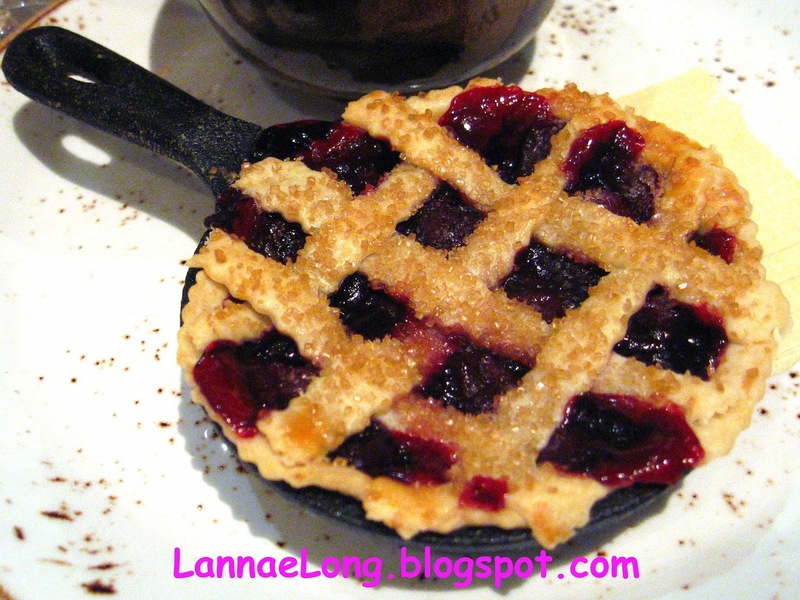 I was so full before dessert came, but I managed to eat my cherry pie anyway :). Then, after dessert, we went over to Barlines, the honky tonk style bar at the hotel. It is big and roomy, the stage has live music ever night, and there is a lot of whiskey to be had. I liked the bar too. It is big, airy, and clean, and the bathrooms are nice too. Not to say that some of the downtown older establishments aren't, but maybe the older establishments plumbing may have seen better days. So this particular evening, the music was a little loud, so it was hard to chat. Maybe it is good for conventioners who just want to sit with each other and not really carry on a conversation, cuz they are sick of each other (seeing each other day in and out). But, taking to the bartender, she said they make their own mixers. They do not use pre-made corn-syrupy stuff, they make their drinks from scratch. I tried a honey lemon whiskey creation and it tasted fresh, with real lemon and honey (not corn syrup). I did not drink too much of this tasty treat because I did have to pack it up and go to my car and drive home safely. The next stop, which I have not tried yet at the Omni Nashville, is Bob's Steak and Chop House, only open for dinner. Bob's is only open for dinner, and I am guessing that this may be a little more pricey than the other 3 options at the Omni Hotel. When I do go, I will have to blog about it and let you know how it is. I kind of don't want to tell anyone about this great 3rd annual event because it has felt like my little secret for the past 2 years. This is such a great tasting event of local food and beverages, there is plenty of free parking, and proceeds go to scholarships. But I am going to share this little secret event, Tennessee Flavors, a Nashville State Community College Randy Rayburn School of Culinary Arts tasting event that will rival many others. There will be over 60 local restaurants, candy, and beverage makers offering tastings of their wares. It is going to be a good time. 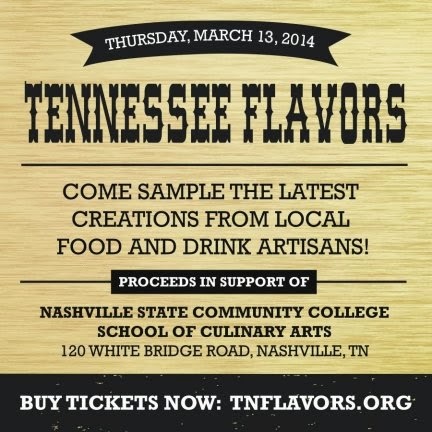 For more information and to purchase tickets, visit www.tnflavors.org or call the Nashville State Community College Foundation at 615-353-3222. Here are some photos I took from last year, there was some really yummy yums to be had. Enjoy! Many weeks ago, I was scheduled to be in Phila, PA for one full day of meetings in Mid-February, and then come right home. Many weeks ago, I reminded the project team that I used to live in Phila, and year after year, the 2nd week of February always has a major snow storm, and I did not want to rent a car and drive, and possibly reschedule for April. One project team member (southerner) cavalierly stated that she WANTED it to snow - tempting fate, and implied that I was wimp for not wanting to drive in snow. Well, I have lived in Nashville for 15 years, and I am a southerner now, and I forgot what it is like to drive in snow. Anyway, it turns out, we did fly into our meeting, she got her wish and Phila got record breaking snow and she all of a sudden had a change of heart about driving in snow, and our flight home was cancelled for 3 days because the Phila airport need to de-snow and de-ice. She was really irritated, and I could not be happier because I now had time to visit some of my favorite restaurants in Phila. 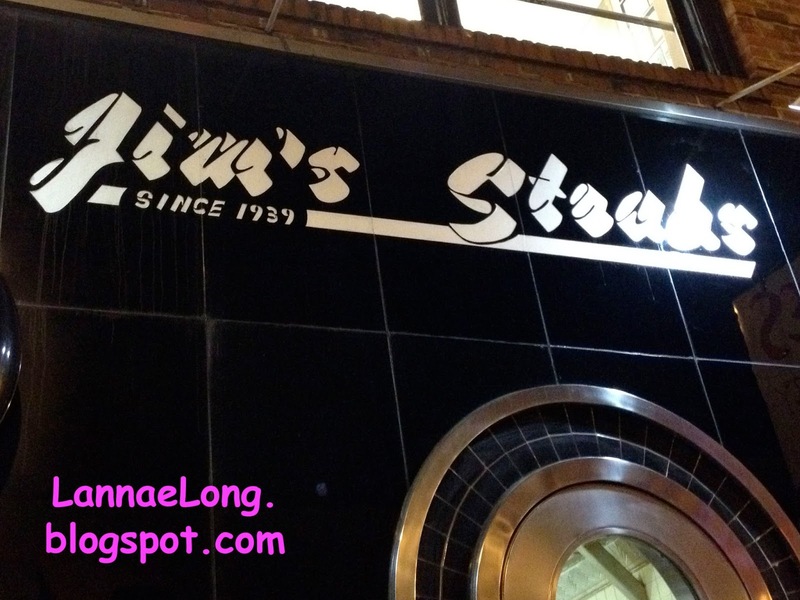 An old haunt of mine was Jim's Cheesesteaks on South St. When I lived in Phila, South St was the place to go to the bars, restaurants, culinary shops, trinket shops, to the Theater of the Living Arts, and Jim's Cheesesteaks. Jim's used to have a line out the door, and it was standing room only to eat these things. Now, South St looks as if it has fallen on "hard times". All the awesome shops are gone, and it looks more like prostitutes and druggies have taken over. But, what still is there, is Jim's Cheesesteaks serving up traditional cheesesteaks to the tourists and locals alike. Going into Jim's seems to suspend disbelief, it felt fine inside, it was not druggie infest inside - rather it was a lot of tourist and people stuck in the city for the night, and short order cook line is the same as it ever was. The best part is that now that South St is not the "it" spot in Phila anymore, it seems to have alleviated that extreme long lines Jim's use to have. There was a line on the night we went, but it was quite manageable, and we got our meals within few minutes. On this record breaking snowy evening, I got my usual, which is a cheesesteak with provolone, onions and mushrooms. The traditional way to get a cheesesteak is with cheese whiz, but I never prescribed to whiz orange food product, I always got provolone. I also liked fried onions. Jim's chops the steak, rather than leaving it in long tough slices. I prefer the chopped steak because it is easier to take a bite of the sandwich. Geno's leaves the steak in long tough slices, so when you bite into the sandwich, a long strand of steak comes out and flops on your chin, drips grease on your shirt, and it is a bit of disaster with steak to bread bite ratios as you go along. I like Jim's for chopping the steak and when you take a bite of Jim's cheesesteak, you get the perfect proportion of steak, cheese and bread every time. 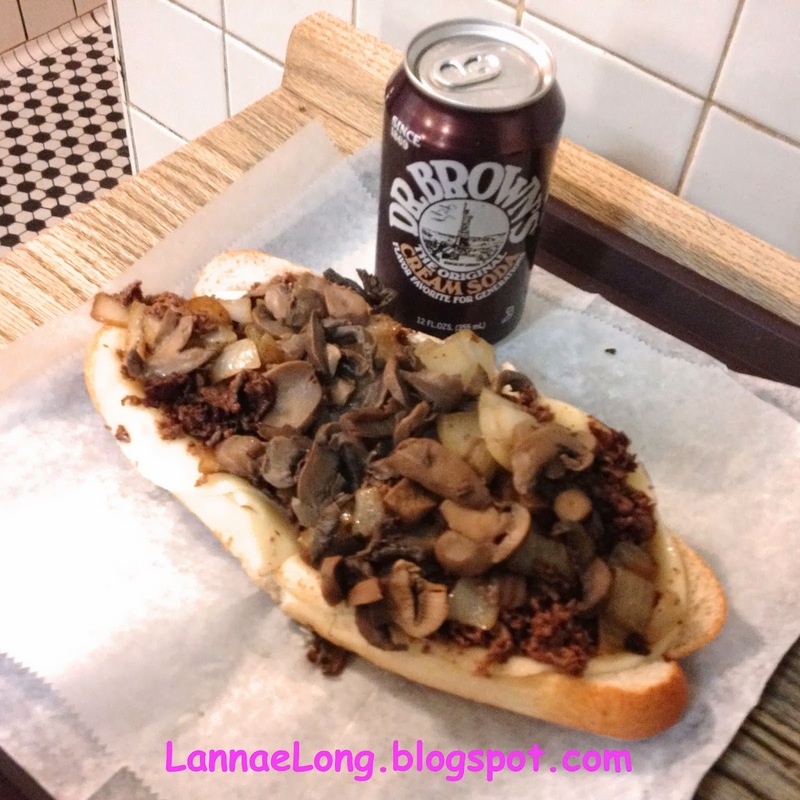 I really like Jim's because of the Amoroso rolls used to make the sandwich, and mostly it is about the bread when it comes to a cheesesteak. Amoroso rolls, I dreamt about for years after I moved to Nashville. I stopped eating sub/hoagie sandwiches in Nashville because there wasn't good bread like Amoroso rolls. Amoroso rolls have this magical thin crispy crust that has a smooth texture on the outside which I adore. The center is light weight, but sturdy to hold a whole cheesesteak, and it is not dense or doughy like so many fakes. Amoroso rolls, how I have missed you so. There is no substitute for the Amoroso rolls when it comes to cheesesteaks. Once you have a cheesesteak on an Amoroso roll, it kind of ruins it for all the imitations. I only enjoy eating cheesesteaks on real Amoroso rolls, the perfect bread for cheesesteaks. Had we not gotten snowed in to Phila, I would not have gotten this treat. Oh Phila Cheesesteak and Amoroso rolls, how I have missed you. I look forward to seeing you again soon, in better weather.